What is a Tunnel Bet and How Does it Work? The Tunnel binary bet is a type of binary options trade where the trader purchases a contract to bet on whether the price action of the asset he has bought will stay within a price range, or break out of that price range. The Tunnel binary trade is also known as the boundary binary trade or the In/Out binary trade. In the first variant, if the trader selects “stays between”, the price has to stay within the tunnel but does not touch any of the price barriers that mark the boundaries of the tunnel throughout the duration of the trade. If he selects “goes outside”, then the price has to touch either barrier before trade expiration for the trade to end in profit. The second variant is the conventional tunnel trade where the price has to be within the price barrier on expiration, or strictly outside either the top or the bottom price barriers on expiration. How does this trade setup work? Firstly, the trader has to setup the trade by selecting the asset he wants to trade. After that, the next thing is to select the price ranges that would create the “tunnel”. This consists of a price ceiling, and a price floor. Once this is done, the next thing is to select the expiration time for the trade, and then select the trade direction which in this case, would be either in the tunnel (IN), or outside the tunnel (OUT). Once this is done, the trader can then execute the trade. Now it seems pretty easy right? Yes, it seems and sounds easy in theory, but the practice of this trade is a different reality. For an “In” trade to be successful, the trader has to basically assume that the price will remain in a state of consolidation. In other words, the asset has to be range-bound or trading sideways without any defined trend. This trade condition usually exists before a major news event is to occur in the market. The markets are usually unpredictable and there is no way of knowing with certainty that the price of the asset will remain range-bound until your trade expiry. The situation is made more difficult by the fact that some brokers do not allow traders to set expiry dates at anything less than 5 to 7 days for a tunnel trade; giving a seemingly range-bound asset time to experience a major trigger to breakout and neutralize the trader’s position. On the other hand, the asset has to experience a major breakout to put the trader’s position in the money. Brokers will generally give a better payout if you stretch the boundaries of your tunnel. So for an “OUT” trade, it is a case of stretching the tunnel boundaries for better payouts, or limiting the boundaries to get a smaller payout. Even in these instances, it is not guaranteed that the breakout needed for this trade to succeed will occur. So how can a trader profit from the tunnel trade? Picture this image above, which is a depiction of the tunnel trade. The yellow area is the tunnel, which is where the “IN” trader would want his asset to end up on expiration. The green and blue areas are where the “OUT” traders hope the asset would end up. You can use the trade definitions above to understand how to map your trade strategies out. 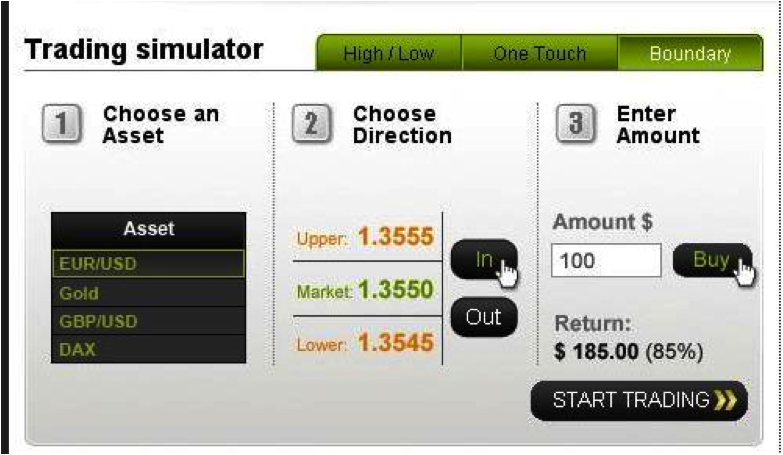 There are various ways of trading the tunnel binary bet. 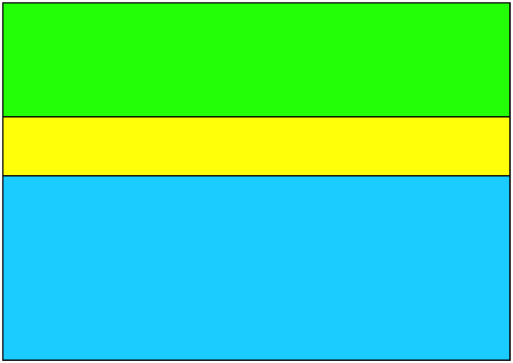 One school of thought likens the image above to a dart board, where it is more difficult to hit the yellow area than either the green or blue area. This trade type will then aim to use the “goes outside” strategy to pick a trade. Recall that you only need the market price to touch any of the barriers just once during this trade. Please note that this is not to be confused with the Touch/No Touch binary where the trader has to define the price barrier to be touched. 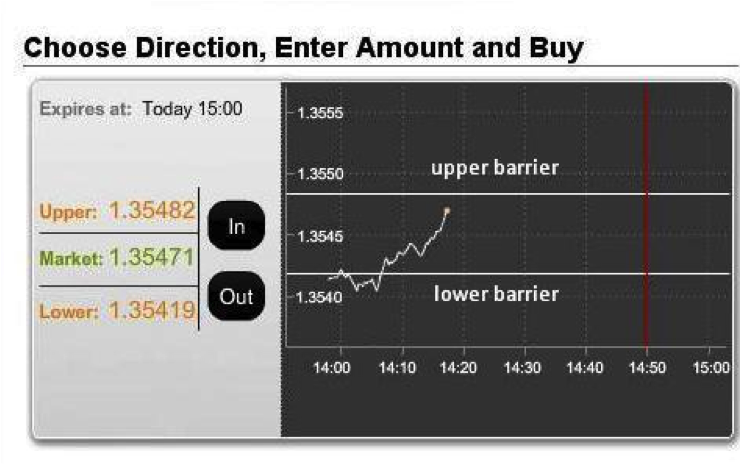 In this binary trade example, the trader does not need to define which barrier must be touched. All that is needed is for any of the two barriers to be touched for the trade to succeed.